Ghost Animal, the Portland by way of California duo of Michael and Marisa, have already made a mark on the blogosphere with a sound more aligned with 1980s dreampop than today’s chilled-out musical vibes. Comprised of previously unreleased singles and B-sides, Youth encompasses the band’s wide-ranging sound, blending lush, melodic guitars with ethereal vocals on songs about young love, loss and self-reflection. Each copy of Youth is dubbed by us onto a brilliant see-through yellow C38 cassette and includes one of three inserts. This release is limited to 50 hand-numbered copies. Browse the Release archive. 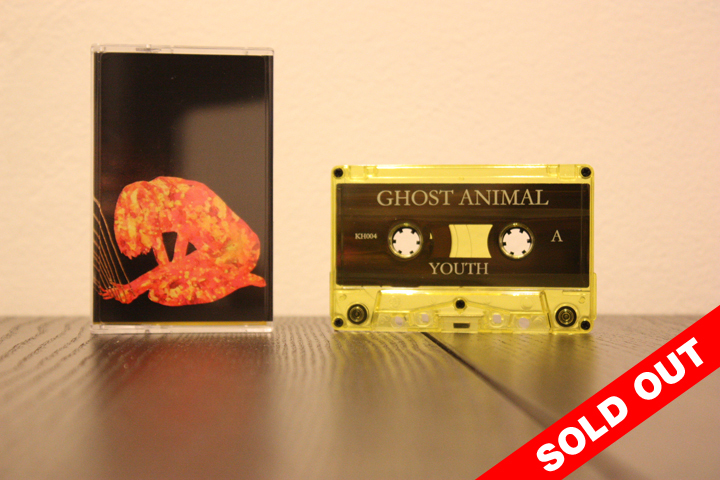 This entry was posted in GHOST ANIMAL, Sold Out, TAPES.